There are many visible changes on the outside with the Micra now looking completely transformed. The changes are not drastic but have been very well executed giving the Nissan Micra quite some appeal. The headlights are now pulled back (in line with Nissan’s new signature headlights) and the grille gets a thick chrome bar. The bumpers are new as well and the front bumper gets chrome on the lower half, right below the number plate. The dimensions have changed due to the new bumpers, with the facelifted car being 45 mm longer, however the wheelbase remains the same. Gone are the soft touches of the old Micra and you can truly appreciate the changes when you look at the old and new Micra simultaneously. Notice how the new car looks so fresh and contemporary even though the body structure remains unchanged. Other changes to the styling of the vehicle include a new hood and front fenders. The fog lights get a chrome surround but oddly front fogs are only standard on the XV premium variant. The side profile reveals the new alloy wheels while the rear now sports LED tail lights (a segment first) and a new bumper with aggressive cuts. The tail gate is now slightly longer with the addition of a plastic part. Two new colours make their debut on the facelifted Nissan Micra, both of which suit the car quite well. Overall Nissan has got the styling update quite spot on, which manages to shed the feminine image of the car to a large extent.Nissan is offering the Micra in seven variants, just like the existing model. The new Micra gets three petrol variants and four diesel variants. The company has offered most features mid-level variant onwards (like iKey and ABS). However the lower variants don’t get alloy wheels and run on 14-inch rubber. The chrome on the bumper is missing on them as well (as can be seen in the above images). The rear spoiler, front fog lights, side airbags and reverse camera are part of optional equipment and should cost an extra Rs. 40,000/-. The changes continue on the inside as well. The design of the dashboard remains almost the same as before but Nissan has made changes to colours and added more features as well. Gone are the multiple colours on the dash, which are replaced with a single colour. The centre console is all new and features piano black finish which looks much better than the silver/grey console found in the old model. The centre AC vents are no longer round and are instead rectangular in shape. The company has added a sea of features like steering mounted audio controls, Bluetooth audio system, climate control, electrically adjustable and folding outside rear view mirrors, reverse parking camera, 4 airbags, etc (most of these features are standard on the top-end XV Premium diesel variant only). Chrome and silver inserts are present on the dash as well as the doors. Nissan has reshaped the seats for better support and cushioning and you feel extremely comfortable inside the car. The Micra has a twin glovebox setup along with an open storage space in between, however lower variants surprisingly get a single glovebox. The power outlet is placed on the lower left side of the centre console, which is not very convenient for the driver or rear passengers to use. Right above the bottom glove box there are ports for USB and Aux. When you open them, the ports are not placed in the same order as its written on the flap, a minor irritant but something which can cause trouble when you are connecting your phone or USB in the night. Space inside the cabin is generous, even though the exterior dimensions will make you think otherwise. Nissan claims the headroom is the highest in its class. The driver’s seat gets height adjust and there is plenty of room to seat four adults in good comfort. Quality inside is good and everything feels decently put together with no rattles or squeaks. The rear seat offers good legroom but under thigh support could be better. The boot is decently big (no 60:40 here) and there are quite a few storage areas in the cabin as well. However there is no seat pocket behind the driver’s seat even though it’s present behind the co-driver’s seat. The Nissan Micra is offered with a 1.2-litre petrol and 1.5-litre diesel engine. The petrol produces about 76bhp of power, while the diesel produces 65bhp. Both these engines are the same since their respective launches. The Micra comes equipped with the globally acclaimed Nissan X-Tronic CVT and a five-speed manual for diesel. These aren’t the most powerful engines in their segment, however they have sufficient power to pull cleanly. There isn’t much of a requirement to shift gears that often. The Micra is easy to drive in the city or even on the highway. Powered by the 1.2-litre petrol engine, the Nissan Micra mileage is rated at 19.34 km/l as per the tests done by the ARAI. The more frugal diesel-powered Micra, on the other hand, is claimed to return an impressive fuel economy of 23.08 km/l, which is around 4 km/l more than the petrol version. On the performance front, the Nissan Micra 2018 specifications notice no change as it continues to feature the same petrol and diesel engines as the preceding model. Similarly, there is no change in the transmission options and hence there is no change in its handling as well.Nissan has tweaked the suspension a bit on the facelifted Micra although dynamics are still not near the Ford Figo or Maruti Suzuki Swift. The Micra rides well on good roads but tends to get shaken on really bad ones, with the ride being on the stiffer side. The petrol version has a tendency to bounce over bad roads but the diesel Micra is more composed on rough surfaces, owing to the heavier front. Handling is good but the Micra is not a car you would find yourself pushing around corners as the steering is light offering little feedback at high speeds. The Micra remains stable at triple digit speeds and the company has improved NVH levels on the vehicle. Braking performance is good but the pedal feel could have been better. MRF, Goodyear and Maxxis are the suppliers of tyres for the new Micra. The new Nissan Micra features ventilated disc brakes at the front and drum units at the back. 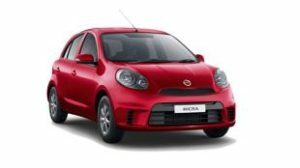 Safety features on the Nissan Micra 2018 include standard dual frontal airbags, driver’s seat belt warning indicator, standard rear parking sensors and speed warning. The base model on the Micra has a new steering wheel and even centre arm-rest. As the demand for automatics is on the rise, this will help Nissan to capture more buyers especially those who need an automatic and aren’t willing to spend a lot more on the features. The other features include push start and stop, keyless entry, in-dash music system with steering mounted controls. There is even ABS on offer as well. The company had earlier even introduced dual airbags as a standard feature for all variants. Now, the base model is offered with a single driver airbag. The Nissan Micra gets a CVT automatic as standard with the petrol engine and that makes it one of the more affordable cars in India to offer this technology. The MY2018 Micra packs new features like a 6.2-inch touchscreen AVN system, rear parking sensors and camera that make the package contemporary. However, the Micra facelift has been around for the last 5 years and now it doesn’t appear as fresh as some of its counterparts.